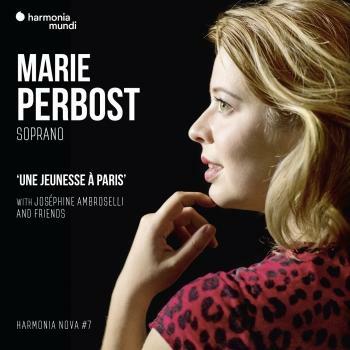 Hailing from a family of musicians, French Soprano Marie Perbost’s first musical experiences date to her time with the Maîtrise de Radio-France, singing concerts at home and abroad under the batons of renowned conductors such as Kurt Masur and Myung Wung Chung. Her musical education continued at the Paris Conservatoire with Alain Buet and Cécile de Boever. For the season 2017/2018, she is a member of Paris National Opera Bastille opera studio. Marie took a keen interest in the repertoire of Lied and French melody thanks to the inspiring teaching of Anne le Bozec. With her perennial pianist and dear friend Josephine Ambroselli, she won the Grand Prix at the 2015 Nadia and Lili Boulanger International Competition as well as prizes at the International Seasons of the Voice competition in Gordes in October 2014 and the 2013 International Lied Competition in Enschende, The Netherlands. They are also finalist of 2016 IVC Lied Competition. Singer and actress, Marie’s has played a diverse smattering of opera and operetta roles such as Blanche de la Force in Poulenc’s Le dialogue des carmélites, Despina in Mozart’s Così fan tutte, Die junge Frau in Boesman’s Reigen and Elisetta in Cimarosa’s Il matrimonio segreto. She won a prize from the Centre Français de Promotion Lyrique given by Raymond Duffaut at the Avignon Opera Competition and finalist (fourth- place) at the International Geneva Competition in 2016. She was flagged as a 2016 Rising Star by the ADAMI, France’s performers’ rights organization. As a soloist, she has caught the eye of many respected conductors and large productions such as Lionel Sow’s interpretation of the Neues Liebeslieder Walzer from Brahms at the Paris Philharmonic, Emmanuelle Haïm’s concert at Paris’s Invalides, or Philippe Pierlot’s version of Bach’s Saint John’s Passion at Paris’s Notre Dame cathedral. She has also been invited as a soloist at Nantes’s Folles Journées festival, the Froville festival, the Mozart festival, Versailles’s Royal Chapel, Paris’s Péniche Opéra, the Perigord noir festival, Le festival de la Vézère, the Pablo Casals festival and numerous other international venues. In december 2018, she will perform Marzelline in Beethoven’s Fidelio under the baton of Jean Claude Malgoire (La Grande Ecurie du Roy) at Tourcoing. An ardent defender of contemporary creation, Marie is a founding member, lead singer and artistic director of the Ensemble 101, a contemporary musical theatre collective that creates and performs its own work. The Ensemble has won numerous awards for French contemporary music and is currently Artist in Residence at the Villa Arson in Nice until 2019. Since 2012, Marie is a beneficiary of a scholarship from the Rhine’s Gold Foundation (a subsidiary of the Fondation de France), the Meyer Foundation, as well as the Kriegelstein Foundation. Watching her dad attempt to play Schumann’s Piano Concerto while singing the orchestral parts at the top of his lungs was Joséphine Ambroselli Brault’s first taste of music. No wonder then that piano became her life’s pursuit. She was awarded her first prize from the Fondazione Antonio Salieri di Legnago in Salzburg (Austria) for a duet with cello when she was barely fifteen years old. Following that, she went on tour in Italy, Germany and the Netherlands, where she decided to pursue her musical training abroad. She left France for five years and studied in Leipzig, Cologne and Brussels. In Brussels, she worked with Jean-Claude Vanden Eynden, who taught her to approach music with intelligence and finesse. Since then, she has dedicated herself to playing in a variety of chamber music ensembles. A particular highlight has been her energetic duet with the soprano Marie Perbost. Together they won the First Prize in the Nadia and Lili Boulanger International Voice-Piano Competition in 2015, they were awarded at the "Saisons de la Voix" International Competition in Gordes in 2014 and the received the “Friends of Lied” Prize in the International Liedduo Competition in Enschede (The Netherlands) in 2013. Music is everywhere but her heart is in Paris. Joséphine Ambroselli Brault returned to France to continue her studies in chamber music and vocal accompaniment at the CNSM de Paris. Studying under Anne Le Bozec was an artistic turning point for Joséphine; her teacher exposed her to a world of incredible sonic diversity. Since then, she has continued to search for more various, more vivid and more expressive sounds in her playing. The piano has become a veritable laboratory. Joséphine is a soloist as well as a chamber musician. She performed at the Salle Gaveau (Paris) in 2012 under the conductor Martin Lebel, who selected her to perform again in 2016 with the Karlovy Vary Symphony Orchestra. Joséphine will also play with the Toulouse Chamber Orchestra in 2017. Struck at a young age by the advice France Clidat gave her, that “a good pianist is a cultivated one,” Joséphine Ambroselli Brault received a Bachelor’s degree in German Literature and derives strength and originality from an interdisciplinary artistic practice. In 2011, her first original piece, Heading Headlong, which mixes music, dance and literature, debuted at the festival “Courant d’Air” in Brussels. She also created in 2014 “The Was Too Blue”, a musical novel based on the novel A Life by Guy de Maupassant. Her forthcoming project will focus on a song cycle by one of her favourite composers, Francis Poulenc.